Around the year 1590, the activity of the Accademia began to be focused on the preparation of the Vocabolario [Dictionary]: the first authors examined were Dante in the Divina Commedia, Boccaccio in the Decameron and Petrarch in the Canzoniere; the criteria that led to this choice of authors being quoted - in Italian Citati - were coherent with the goal that the vocabulists wanted to reach: to demonstrate and preserve the beauty of the Florentine language in the 14th Century. The sorting process did not only consider 14th century Florentine texts, both literary and non-literary, but also took into consideration more recent authors (such as Lorenzo de’ Medici, Berni, Machiavelli, and even Salviati itself) as well as non-Florentine authors (Bembo, and Ariosto). The vocabulists also considered methodological issues, particularly regarding the treatment of words that were in use but lacked ancient documentary evidence, as well as the issue of the inclusion of etymological data: regarding the first problem, they decided to include examples from modern authors up to Monsignor della Casa; Regarding etymologies, they agreed to consider solely those “che abbiano gentilezza e sieno a proposito” ('that are pleasant and have relevance'). In both cases the decision was referred to the judgement of the Deputati per il Vocabolario ('Deputees for the Dictionary’), a committee formed by four Academicians - Carlo Macinghi, Francesco Marinozzi, Piero Segni and Francesco Sanleolini - appointed in 1597 to speed up and facilitate the editing of the Vocabolario. The same criteria were followed for the compilation of the Dictionary, so that the 14th century Florentine writers were the first to be quoted, where possibile giving an example from prose and one from poetry, the most beautiful words of Florentine origin were chosen from the works of non-Florentine poets, while from contemporary authors they picked words of current usage. The Vocabolario degli Accademici della Crusca was printed in Venice in 1612, instantly arousing great interest and equally heated controversies regarding the criteria adopted; many people particularly disliked the clearly archaic Florentine model proposed by the Vocabolario which, however, represented for centuries, in a politically and linguistically divided Italy, the most precious collection of the common language, the strongest internal bond of the Italian community, and an indispensable tool for all those who wanted to write in good Italian. 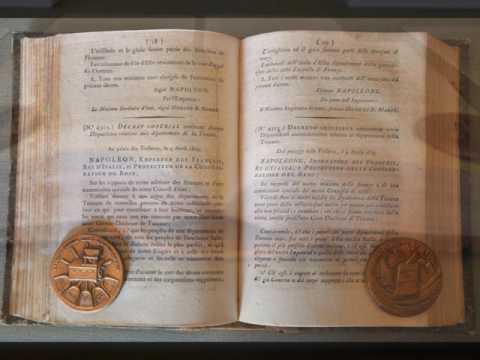 The Vocabolario had great success around Europe and became the lexicographic model for other European academies for the editing of the dictionaries of their respective national languages.